Source: Water & Power Technologies, Inc. Reverse osmosis is the process by which water under pressure is forced through a semi-permeable membrane from a more-concentrated to a less-concentrated solution. Reverse osmosis removes dissolved solids, organics, colloids, particles, bacteria, and pyrogen from water. 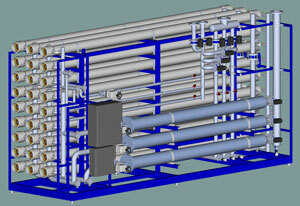 Water & Power Technologies, Inc.